Cosma Nature Pouches Mixed Trial Pack 6 x 50g | Wet cat food at zooplus! Poorly cat was tempted by these! :"Poor puss was in hospital for a couple of emergency surgeries, if that wasn't bad enough, he came home with cat flu! He's supposed to be on a renal diet, but he won't touch any of them. He's not eat"
Cosma Nature is a supplementary all-natural wet cat food with an exceptionally high 75% meat or fish content. 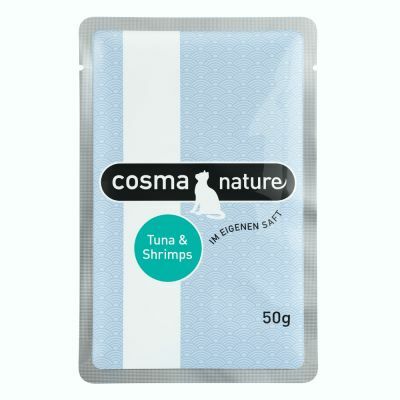 Choose from tasty tuna, tender chicken fillet, delicious chicken breast or delicate salmon, as well as tuna & shrimps and chicken & chicken ham. 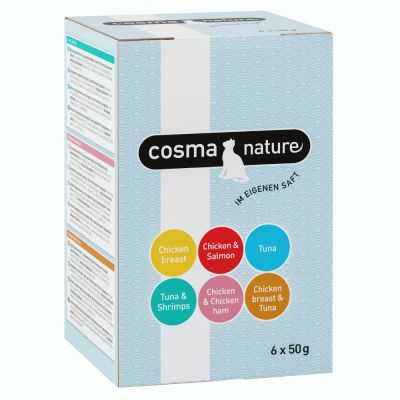 The wholesome ingredients are gently cooked in their own juice which helps to retain the natural flavours and nutrients. The handy, single serving pouches ensure that the food stays fresh and is easy to portion. Your cat can enjoy a different variety every mealtime. Cosma Nature is a premium quality wet cat food and made to standards applicable to human nutrition. 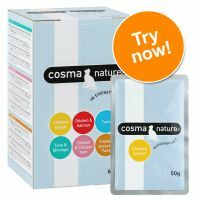 Let your nose be the test of Cosma’s great quality: open a pouch or can of Cosma Nature and sniff the contents gently. You will notice how natural and appetising this cat food smells and looks and your cat will definitely be of the same opinion. Feed your cat 1-2 pouches per day in at least 2 separate meals. Serve at room temperature. Always ensure plenty of fresh drinking water is available. 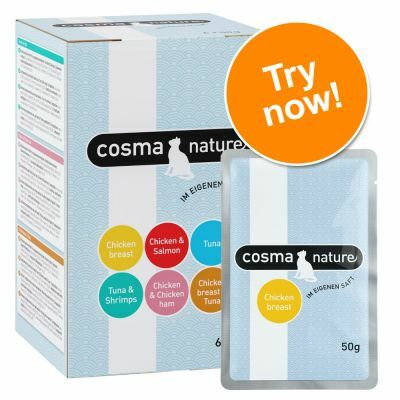 Keep opened pouches in the fridge and use within 24 hours. Poorly cat was tempted by these! Poor puss was in hospital for a couple of emergency surgeries, if that wasn't bad enough, he came home with cat flu! He's supposed to be on a renal diet, but he won't touch any of them. He's not eating much at all and, getting worried, I ordered some new foods to try. I hit the jackpot with this one. Puss loves them, and has wolfed down the three sachets he's been offered so far. Hopefully he wil continue to enjoy them, I'm just about to order more!